i receive two lp boxes from san fran this evening containing several life changing items. 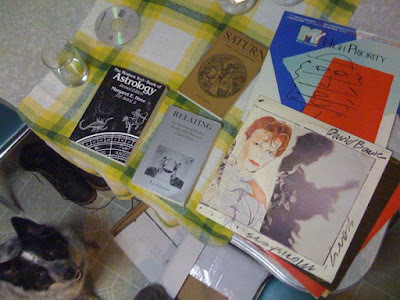 astrology books, mix cd's and LP's abound. if you've ever pulled off the highway in Martinsburg WV in a frantic effort to obtain a CD featuring Janet Jackson's Control, then you know what getting this LP means to me tonight. josh i own you a phone call, but you know I got the phone-phobia. speaking of which, add that to my list of possible novels: On the Line: Fear, Loathing and the Telephone. we would have kept control but we already have it on cassette (for the car) and cd (for home). 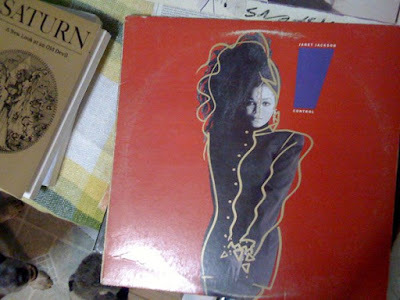 we don't listen to vinyl in the car, so to sarah it went! jj's 'control' was THE soundtrack of my junior year of high school. i must find my cassette. BTW, i love your coffee-mint soap, i purchased it at ink+peat in PDX! that's some good loot, girl. saipua was in my dream last night. i don't remember much of the details, but there was an orange, a bar of soap, and a haunted house involved. I LOVE THAT SONG. 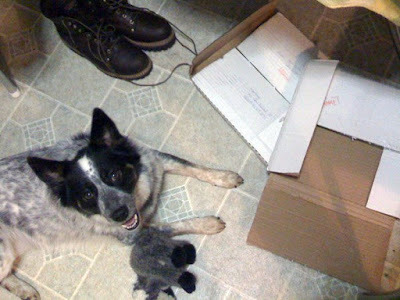 The dog seems pretty stoked about it too. who's that making that nasty soap?